"BBC Countryfile Live will be hosted within the spectacular grounds of Oxfordshire's historic World Heritage site Blenheim Palace, BBC Countryfile Live will showcase the very best of our countryside. This exciting new event will combine the tradition of the UK's best county fairs with the quality editorial and presentation of one of the BBC's flagship programmes. Explore every aspect of the British countryside through exciting live arena shows, talks, hands-on activities, animal displays, farming in action and shopping with more than 600 food and craft producers and even a great British pub garden. It all adds up to a fun, inspiring and informative day out in the countryside." 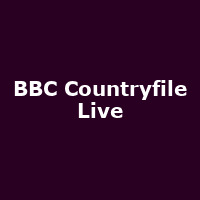 Thu 1st Aug 2019 BBC Countryfile LiveBlenheim Palace (Oxford)More Info..
Thu 15th Aug 2019 to Sat 17th Aug 2019 BBC Countryfile LiveCastle Howard (York)More Info..